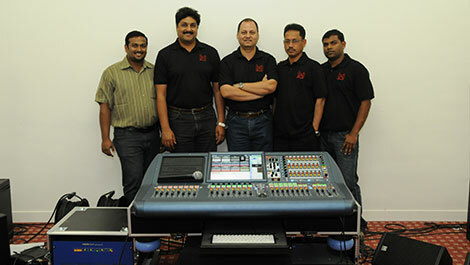 Nicolas Kyvernitis Electronics Enterprises, distributors of Midas and Klark Teknik in the Middle East have recently supplied a new Midas PRO2 digital live audio system to Business International Group’s AV Production Department. Based in Muscat, Oman BIG Rentals provide technical expertise and equipment to numerous corporate events taking place across the Sultanate. The PRO2 system is a 64 channel mixer with a compact 24 channel frame providing a total of 156 inputs and 166 outputs point-to-point routing anywhere within the AES50 network. With 27 sample-synchronous, phase-coherent mix buses the PRO2 is a compact yet powerful mixing solution for professional sound engineers in a live sound, broadcast and permanent applications. “BIG Rentals are continuously growing due to their high level of service in the market, their reputation precedes them and they have reinvested in themselves by purchasing a mixing solution that fits one of their core values which is quality,” commented Chicco Hiranandani, Business Development Manager at NMK.